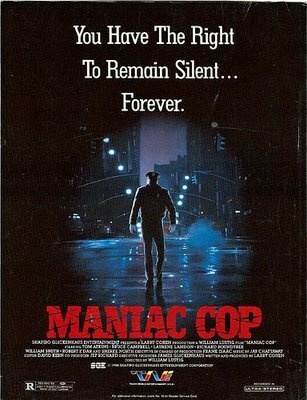 Maniac Cop (1988) – Winning. Words. Law and disorder collide as a belligerent bobby paints the New York streets red, with only horror icons Bruce Campbell and Tom Atkins in his way. Paper-thin plotting (it was written in 10 days), hilariously obvious stunt doubles and horrific prosthetics are all part of the cheesy charm, while the picture’s been dusted down nicely for this hi-def re-issue.